It is my pleasure to welcome AAMBookclub Author Princess Dior to Conversations today. She's here to talk about her new release, Crowned. Be sure and check out her interview and get to know Princess Dior. Roxy has been on a paper chase ever since her mother was incarcerated. Left to fend for herself she turns to the one place that doesn’t judge her; the streets. When her life begins to spiral out of control she has to decide whether she is ready to own up to her mistakes and the people she has crossed or trade in her Gucci shoes and king-sized bed for state issued slippers and a twin sized cot. Princess Dior, born Princess Estella Dior Washington to Queen Esther Perkins, faced many challenges in her younger life. Raised by a single mother that she viewed to be the most powerful woman in the world, Princess’s life was nothing less than boring. Growing up, Princess watched as her mother hustled to provide for her and her siblings by any means necessary. Taking great pride in her mother’s determination to raise her family, Princess embodied in her strength which molded her into an outspoken, well-dressed little girl with her eyes on the world. Grounded by the church, and expressing hobbies for writing and speaking publicly, Princess began to showcase her talents at the mere age of thirteen and has yet to look back. Filled with the desire to help, she began to use her talents to motivate and uplift others through writing and public speaking. Since being raised in a church filled environment, Princess knew that taking on the role of being over the morning announcements and the dance ministry would be worth something more than a resume builder. Taking her religious values very seriously, Estella believed that she was destined to do great things. As life would have it, Princess took a turn into the game of survival which lead to leading a life as a “Hustler’s Wife”. Becoming accustomed to the fabrication of a fabulous life, Princess turned to the streets to provide her with all of life’s riches. Hustling became her new lease on life until she found herself facing a 35 year prison sentence. With her hands clasp together on bended knees, she remembered her mother saying “No weapon formed against you shall prosper”. Renewing her faith in God, Estella began to reevaluate her outlook on life. Feeling that the enemy won, Estella’s reclamation of her salvation while in wait at the women’s detention center only added more blessings for this newfound young woman. Winning the Correctional Idol Contest gave her the affirmation that she needed. Recommencing the skills that never left her hand or her heart, Estella won a spot on a CD with Malcolm Jamal Warner and on Russell Simmons Def Poetry Slam. Enjoying her renowned love for writing, poetry, and mentorship, Estella spread all of her positive energy throughout her family and ministry on love, life, and inspiration. By creating an image to inspire others with her story and the recreation of her life, this aspiring Media Mogul wanted to share her trials and tribulations to mentor others and show them the path that God has set forth. Knowing and believing that God can and will show up in your life during your most controversial times, Estella wants all to know that being patient and humbling yourself proves that you too can make the right advancement in life. Now living a life of substantial wealth in Christ, Estella is a free woman who’s working and building her media empire that motivates and inspires others through the works of art and entertainment. Currently taking pride in her husband, Dorian Wright and their children, she looks at life to be enriching and full of a well-rounded support system. Feeling compelled by her story, Estella feels that there is no shame in sharing her life story. She hopes that her story heals and motivates those that feel all hope is gone. Estella Dior is a, Wife, Mother, Entrepreneur, Motivational Speaker, an Author and a Spoken Word Poet who has overcome trials and tribulations with goals to enrich and inspire everyone she meets. Her hopes are to transform each being and to convert their lives from walking by sight, but by Faith alone. We would now like to officially introduce the world to the transformation of “Estella Dior, Media Mogul”. As a child I would always write and I loved to speak. After facing many adversities in my life, I was introduced into a new world where I could live the American Dream if I stayed on the right path. I knew that if I told my story, I could help others that may be in some of my past situations. What were some downfalls of writing? Princess Dior: Staying focused was really hard for me. I live with, not suffer from ADD. With my love for writing, I had so many tell me that I wouldn’t or couldn’t do it. This always played over and over in my mind, but with strength and perseverance, I won that battle. What advice would you give another inspiring author? Never let someone speak your life into existence. If you can think it, you can become it. Always continue to strive to be whom and what you want to be, your dreams are your destiny. There will always be a yes in the wake. My life is my plot. From a young child until today, there is always a new road of discovery. What message do you want your readers to receive after reading your book? That no matter what you have been through, your past doesn’t determine your future. Yes, my sequel to “Crowned”. Stay tuned in, this one will answer a lot of questions about the real Roxie. And the plot really thickens! What would you say mostly inspired your journey? 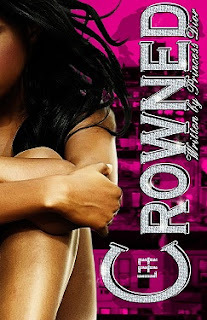 My mother, Queen Perkins and her faith in me along with my strong belief in God inspired me to write “Crowned”.